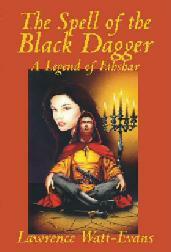 When I was writing The Spell of the Black Dagger, I made some fairly major cuts and revisions. I also saved all the material I cut, which I don't always do. I thought some of my readers might be interested in seeing some of this material. This isn't everything from my "Outtakes" folder, but I think it's everything that's of any possible interest to the casual reader. The pieces I haven't posted are mostly just early drafts of scenes that did wind up in the book, albeit in somewhat different form. So here are links to the various fragments. These aren't complete stories, or even finished prose; they're bits and pieces that didn't make it into the novel. Anything about Ethshar's history, society, and magic that's mentioned in them may or may not be accurate; the geography is all correct, though. Two snippets explaining why I changed my heroine's name. Tabaea looks for a quiet place to conduct a magical experiment. A guardsman looks at some local scenery from atop the city wall. The city guard prepares to face Tabaea's mob. The original Chapter Thirty-Eight, which was removed completely. Various bits I trimmed from various places.